With tensions high between the West and Russia, Dr Stuart Parkinson, SGR, examines the growing threat of nuclear war - including key scientific and technical data - as well as the potential of a new UN treaty which bans nuclear weapons. Dr Philip Webber, SGR, looks at cases of positive transitions from the Cold War period and more recently, to help us tackle the security problems of today and tomorrow. Analysis showing how the UK's Trident nuclear weapons are powerful enough to cause a nuclear winter, and the implications of this for the UK's policy of nuclear deterrence. An updated analysis of the large-scale and problematic involvement of the military/ arms industry in UK research and development - including an assessment of alternative priorities. Presentation by Dr Stuart Parkinson, SGR, at SGR conference, Universities for Sale? Presentation by Prof David Webb, Leeds Beckett University/ SGR, at the 2016 Peace history conference, Leeds, UK. Presentation by Dr Stuart Parkinson, SGR, at public meetings in Preston and Lancaster in mid-2016. 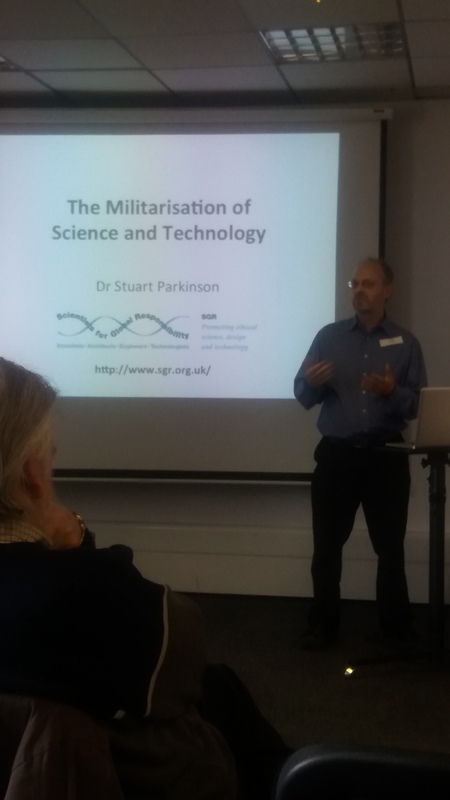 Dr Stuart Parkinson, SGR, summarises how science and technology are used to pursue military aims in the UK - within government, industry and universities. He highlights the problems this causes and the need for change.